The life cycle of many social insects living in seasonal environments is characterized by a period of (pure) investment into worker brood followed by a phase of pure allocation of resources to the production of sexuals. Researchers have invested some effort to find possible correlates (proximate triggers) of this transition but current empirical knowledge does not provide clear evidence. 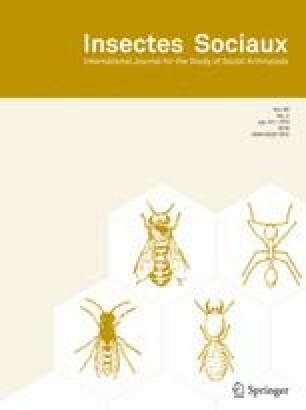 Utilizing an established theoretical model—modified to account for brood developmental time—we show that a strategy that switches to the production of sexuals at a particular (fixed) date may typically perform better than strategies linking the transition to the status of the colony in terms of attributes like worker or brood number, or the colony’s age. Our results provide rationale why the search for cues triggering the transition in investment has been inconclusive at best and suggests a number of experiments and observations that allow validating our arguments. We thank two anonymous reviewers for their comments, which helped to improve the manuscript. Funding was provided by the German Research Foundation (DFG), Collaborative Research Center SFB 1047 “Insect timing”, Project C6 to TH.